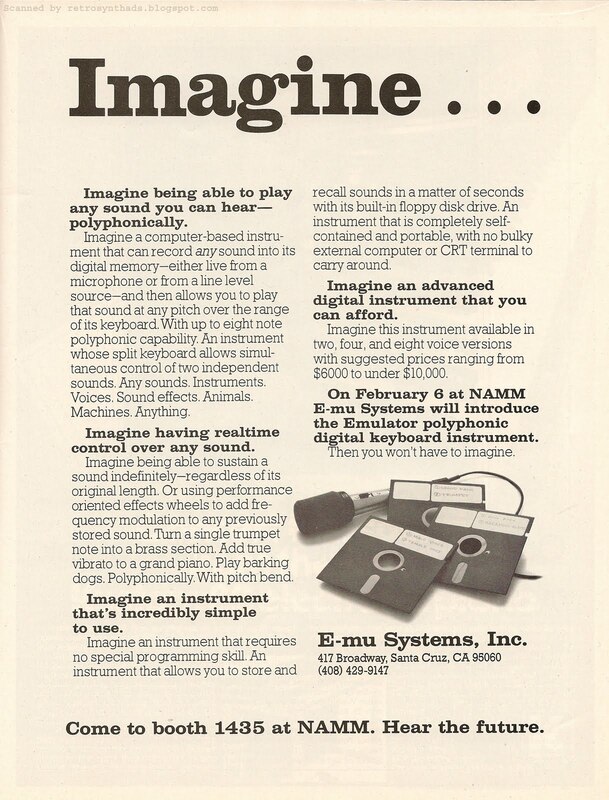 E-mu Systems Inc. 1-page Emulator sampler advertisement from page 21 in Contemporary Keyboard February 1981. The ad that started it all for the Emulator! This introductory ad only showed up in Keyboard magazine for a few months in the first quarter of 1981. 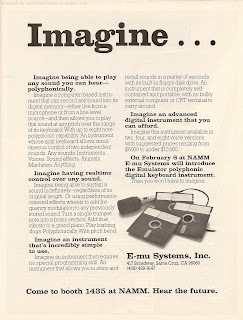 And intentional or not, I can't help but think this ad's theme of "Imagine..." is sampling a little bit from John Lennon's 1971 song "Imagine". Coincidentally, John Lennon was murdered only a few months before this ad made its first appearance in CK, and Marco Alpert, E-mu marketing manager during this time period, confirmed that there is no connection. Advertising submission lead times required by magazines back then were quite a bit longer than they are today, and it was quite likely the ad was created well before John Lennon's death. The ad-copy is really well written and provides readers with a simple summary of how to sample, edit, and play back sampled sounds. And E-mu is given extra points for relating the ad-copy directly to the photo of sample disks. References to sampling a trumpet, grand piano and barking dog - these are written on the disk labels as well. But the most interesting thing about this ad-copy is the fact that it mentions the NAMM show. And its not like most gear ads where the "come to our NAMM booth" is slapped into the bottom or corner of the ad as an afterthought. No, this ad's main purpose is to make sure readers know that they can come see this beast at NAMM on February 6, 1981. All previous ad-copy is a lead up to let readers know they "won't have to imagine" any more. The design of the ad is also top-notch in my opinion. Nicely laid out, large photo, and clean with lots of white space. And, I'm going to assume it was intentional that they didn't include a photo of the Emulator itself, to help peak readers' curiosity and head over to the NAMM show. If you didn't make it to the NAMM show, you would have to wait until June 1981 to read more specs about the Emulator in the Spec Sheet section of Contemporary Keyboard. "E-MU EMULATOR. The Emulator is a computer-based instrument that allows you to digitally record any sound, either with a mike or from a line-level source, and then play that sound at any pitch over the range of its 4-octave keyboard. The unit lets you play up to eight notes polyphonically. It has a split keyboard which allows the simultaneous control of two independent sounds. Vibrato can be added to any sound using a standard modulation wheel. A second wheel is used for real-time pitch-bending. Using a loop function, any sound can be sustained indefinitely, regardless of its original length. The system also includes a built-in disk drive which lets the user store sounds on diskettes (mini-floppy disks) for recall at a later time. The instrument comes with a library of prerecorded sounds, and a continuing series of additional sounds and special function software (including a real-time multitrack sequencer) will be made available in the future. According to the manufacturer, the unit is designed to be simple to use, requiring no special programming skill or knowledge of computers. E-mu Systems, 417 Broadway, Santa Cruz CA 95060." What is not mentioned is pricing, which you can find online in this early 1981 Emulator price list (PDF) from emulatorarchives.com. For example, the eight voice Emulator went for $9,995.00, and the real-time sequencer would cost users an additional $995.00. "The in-house product name for the Emulator I was the "Sampler". For us, that was kind of a pun between Nyquist's sampling theorem - which is an obscure piece of mathematics that underlies the whole genre - and the Whiteman Sampler, a box with a whole bunch of different flavors of chocolates in it, because this was an instrument that could have a whole bunch of different sounds".